Beautiful 4 Bedroom Home Priced to Sell!! 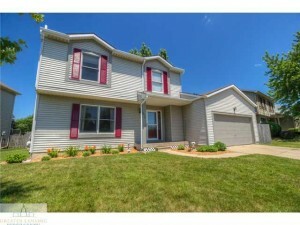 5012 Aspen Drive in Lansing is a spacious 4 bedroom and 2.5 bathroom home that is priced at $154,900. The lower level features a large kitchen and family room area, brand new carpets, a beautiful fireplace, and a sliding glass door that leads onto the large back porch. When you step outside, you find a large wooden porch with steps that lead to a beautiful pool and fenced in backyard. This is the perfect home for a growing family. To schedule a viewing, contact Matt Smith.